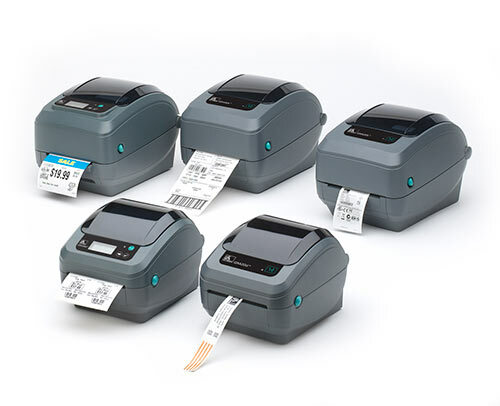 Zebra G Series Desktop Thermal Label Printers. Zebra G Series Desktop printers are affordable, high-quality label printers for low- to medium-volume direct thermal and thermal-transfer applications. The G Series compact, space-saving design contains a powerful 32-bit processor for fast label printing, and a 8 MB Flash memory for increased storage of fonts and graphics. These printers support a variety of label widths up to 4.25" wide for standard desktop applications. They also include both EPL2 and powerful ZPL II programming languages - making it easy to integrate with other Zebra printers. Options include peeler/dispenser for extended versatility. The G Series printers are perfect for government, healthcare, retail, manufacturing and transportation/logistics label printing. Zebra's feature rich, competitively priced GC420 desktop printers bring Zebra quality, durability and reliable performance to many low to medium volume, direct thermal and thermal transfer printing applications. Zebra's economically priced GK420 desktop printers have a small footprint yet bring Zebra quality, durability and reliable performance to many low- to medium-volume, direct thermal and thermal transfer printing applications. Zebra's economically priced GX420 & GX430 desktop printers have a small footprint yet bring Zebra quality, durability and reliable performance to many low- to medium-volume, direct thermal and thermal transfer printing applications.